Competitions are underway on all board sizes at this year’s US Go Congress. 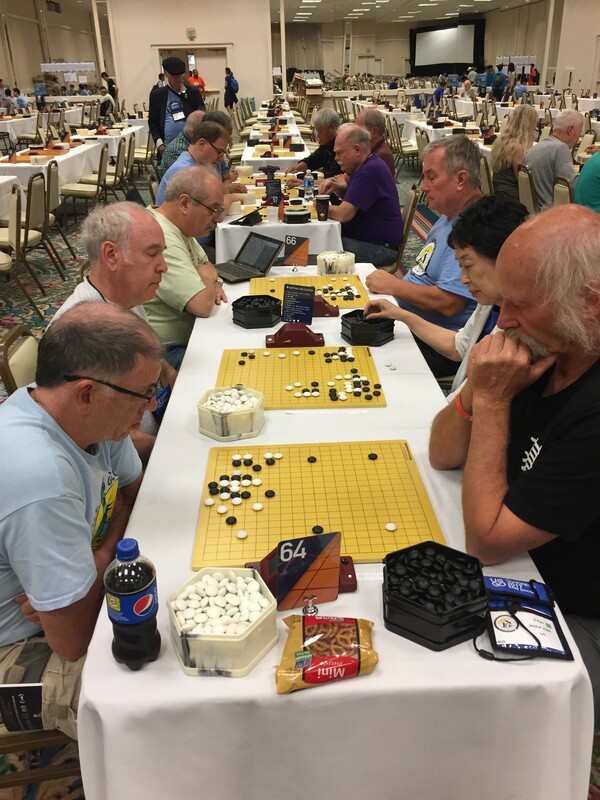 Official Congress tournaments kicked off Saturday with the Pandanet AGA City League and the 9×9 tournament, and continued Sunday morning at the first round of the US Open and US Open Masters Division. All players will have a chance to face off in nine other tournaments throughout the week, both rated and unrated, including: Evening League (replaces the Self-Paired), Lightning, North American Pair Go Championship, the Women’s Tour nament, the Seniors’ Tournament, 13×13 Tournament, Under-16 Girls’ Tournament, the Die Hard Tournament, and Crazy Go. Youth players have their own full schedule of tournaments as well: The Redmond Cup, Youth Lightning, Youth/Adult Pair Go, Youth 13×13 and 9×9, the Youth Team Tournament, and Relay Go. Stay tuned for updates and results for all these events. Now in its second year, the Seniors Tournament kicked off Sunday afternoon bringing about 35 players, many of them long-time Go Congress attendees and old friends, together for amicable competition for players over 55. As players gathered amidst warm greetings, many were not surprised to see familiar faces across the board. “Hey Betsy, you’re over here,” called Mark Nahabedian (left in photo at left); “I knew it!” Betsy Small (at right) replied with a smile. 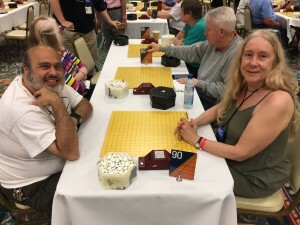 photo (right): Seniors Tournament round one. Front board (l-r): Bart Jacob vs. Steffen Kurz; second board: Peter Schumer vs Miyoko Miyama.